You’re in the right place if you teach middle school science. My name is Chris Kesler, and I create engaging activities that will help students learn difficult science concepts. One of the biggest challenges for teachers is to find the necessary time to create meaningful science lessons for their classes. Does that sound like you? In the summer of 2015, I took a break from the classroom to help solve this problem for science teachers across the country. Kesler Science was born. 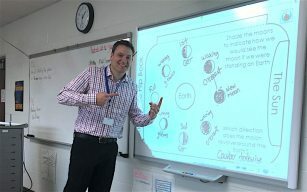 I’ve dedicated thousands of hours to bring you middle school science resources which make you feel less stressed and more confident in your day-to-day teaching. As the number one middle school science seller on Teachers Pay Teachers, you can feel confident the lessons have all be vetted by classroom teachers like yourself. Tens of thousands of teachers use my products in their classrooms. Schools or district licensing information can be found here. Have a correction request for a Kesler Science product? You can report it here. Looking for an amazing PLN of like-minded science teachers? The Facebook group is like the teacher’s lounge you wish you had on campus.